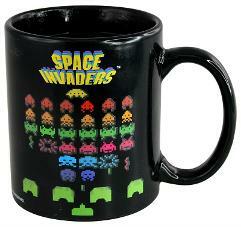 On this page you find a fantastic range of mug gift ideas with a retro gamer theme. Each time the recipient drinks their favourite beverage they can dream about being transported back to the 80s and playing classic 8-bit video computer games such as Pac-Man or Space Invaders. Who would have thought that a Jet Set Willy mug would be popular in 2016? Well, it certainly is, and so are the other gamer mugs featured here. There are lots of quirky gamer gift ideas here, and some mugs even come with keyrings. Simplyeighties.com is a participant in the Amazon EU Associates and Redbubble affilliate advertising programs. These are designed to provide a means for us to earn fees by linking to products on their websites. The 80s without Atari would have been a lonely place for many gamers. From the 2600 console to the ST computer, and the many classic arcade games, just about everyone has some experience of the legendary gaming giant. 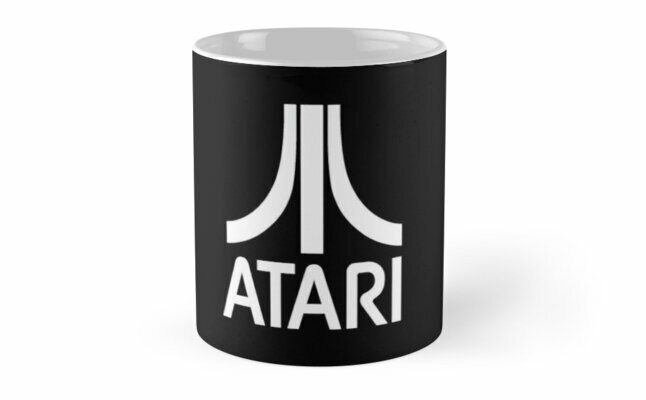 By far, the biggest range of Atari mugs can be found at Redbubble.com. This was an insanely addictive puzzle game from the early 1990s, in which you had to guide groups of human-like, suicidal lemmings through obstacles and safely to the exit. During the early 90s an 8-bit hand-held console called the Game Boy took the World by storm. Celebrate those good times with a funky retro gaming mug. Many colours available. Game Boy Coaster also available. This fantastic retro gaming mug features lots of different characters and objects from various classic 8-bit games including frogger, Pac-Man, Q*Bert, Bubble Bobble etc. 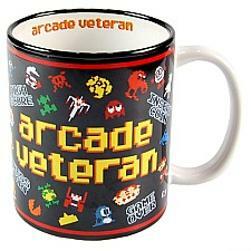 The perfect gift for, erm, an arcade veteran! Remember the names of those four ghosts? I'll put you out of your misery - Blinky, Inky, Pinky and Clyde. It is Blinky (also called Shadow) on this retro 80s mug which is the perfect gift for fans of the world's most popular electronic maze game. Also available in just white. Add any name to this high quality mug which would make an ideal guft for birthday's, Christmas etc. A lovely gift-boxed mug that will change it's imagery as you add a hot drink. Please note this is not dishwasher or microwave safe. Features a high quality, wrap-around print. 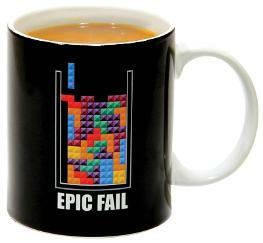 A fun mug for gamers designed by Shaw T-shirts. The message on this mug is printed on both sides, so when your partner bursts into the room demanding that you do something useful just smile and show them the mug! 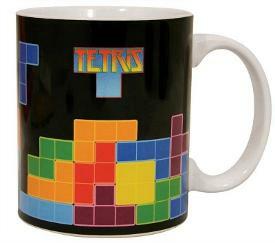 One of the most popular puzzle games of all time for features on this retro gamers mug. Fill with a hot beverage and the game imprint will appear. Presented in a gift box. 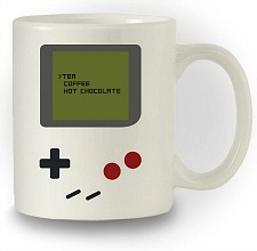 The perfect gift for retro gaming fans and this stylish mug comes in a presentation box. It features a clever heart design made from Tetris blocks. A gift-boxed mug featuring the classic puzzle game which was born in the 80s. Ideal for Father's Day, Birthday's etc. 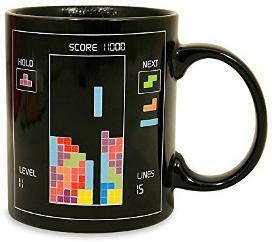 An amusing mug for gaming fans, or maybe someone who is very bad at playing Tetris! An offiical design which is printed in both sides of the mug and comes in a gift box. Fans of this classic 8-bit 80s game will simply love this official mug which features ZX Spectrum style graphics that change as you add a hot beverahge - comes in a presentation box. The 1up mushroom first appeared in Super Mario Bros back in 1985. Fans of the Mario games will love this mug by Pyramid International which comes in a gift box. This classic shooting game first hit the arcades in 1978 and went on to become hugely successful. Indeed, there can be hardly anyone who hasn't heard of this game! 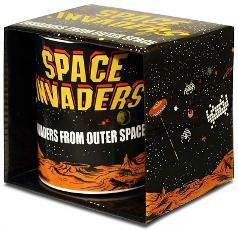 When you add your favourite hot beverage to this officially licensed mug the invaders will appear! Comes in a gift box. Add any name! An ideal Birthday/Christmas present. This is a quality mug that is microwave and dishwasher safe and comes well packaged. 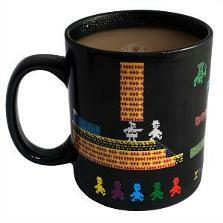 A high quality, hand-printed ceramic novelty mug by TopZog especially for fans of 80s retro gaming. Although a little more expensive than unofficial mugs, you can't quite beat the real McCoy, and this mug oozes quality and features a licensed design. It comes in a gift box (as pictured) and would make a lovely gift idea. Although it's not official, we really like this cool retro design which is printed on both sides. Created in Britain by Daemon Design. If Sinclair or Atari didn't float your 8 bit boat then chances are you were a Commodore fan. This is the ideal retro gift for C64 users and comes in a smash proof box. A very stylish looking retro computing mug featuring the original C64 logo from the 80s. 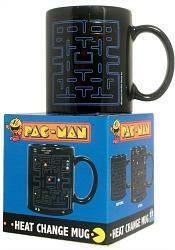 This is a fun idea and Speccy fans will adore this mug which comes in a presentation gift box. 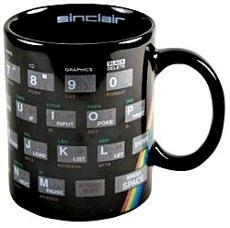 Celebrate the Speccy years with this Spectrum 48k keyboard mug filled with yummy sweets. Exclusive to Sweet and Nostalgic on Amazon. The original game was launched in 1991 and helped propel Sega to become a 16-bit gaming giant through the 90s. There are a number of mug designs available celebrating the character. This is an official mug especially for those retro gamers who spent many a late night playing the ultimate platform game on their Nintendo Entertainment System back in the 80s. Ideal funny gift for any gamer who's just married. High quality mug made in the UK featuring 1980s style "Game Over" text. Available with red or black inside. 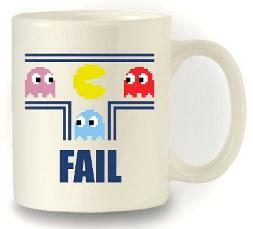 An amusing mug which will be appreciated by ageing gamers - comes in a gift box. 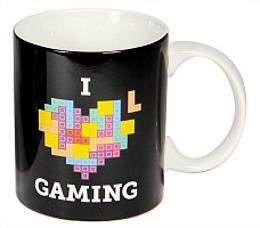 Funny mug for gamers made in the UK. Comes in a sturdy box and a great gift idea for gamers of any age. A very cool, heat resistant coaster which is designed to take any standard sized mug. 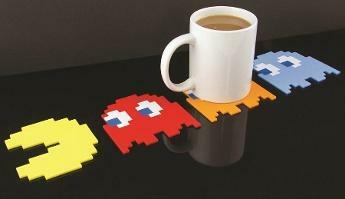 A set of four silicone coasters featuring Pac-Man and three ghosts. Quirky gift idea for gaming addicts. Official Pac Man & Ghosts Ice Cube Tray.